to save song, right click here and save. YOU ARE INVITED TO DOWNLOAD FOR USE ON YOUR COMPUTER, MP3 PLAYER OR BURN IT TO A CD. 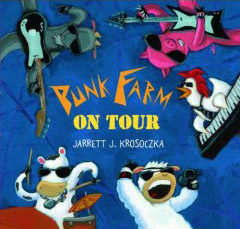 MUSIC IS COPYRIGHTED MATERIAL AND PERMISSION IS NEEDED FOR ANY USE OUTSIDE OF PURPOSES TO PROMOTE PUNK FARM, JARRETT J. KROSOCZKA OR HIS BOOKS. to save "Wheels on the Van", right click here and save. to save "PF on Tour Interlude", right click here and save.